Rev. George Chapman – Rev. Chapman served as rector of St. Paul’s Episcopal Church in Brookline, 1978-2008. He earned a M.Div from Episcopal Theological School and a BA from Washington and Lee University. He has done non-degree studies at Boston College and The Hebrew University of Jerusalem. He is board president of the Honduras Development Network and a member of Brookline Rotary. He volunteers with Honduras Missions and Project Stretch, Dentistry for Children. Nancy Daly – Nancy Daly is a strong advocate for older adults in her political and community activities. She was co-chair of Age Friendly Brookline. She served 12 years on the board of selectmen and 8 years on the Town’s advisory board. In 2015 she raised $11,000 for our respite program competing in Brookline Rotary’s Dancing with the Stars. Ruthann Dobek, LICSW – Ruthann Dobek is director of the Brookline Council on Aging and director of the Brookline Senior Center. She holds an MSW from Boston University and a BA from Clark University. She is a field instructor for Boston University and Wheelock College’s Schools of Social Work. She has been honored by the National Association of Social Workers. Barr Jozwicki – Proud grandfather of six, father of four and husband to Joyce. Barr has lived in Brookline for 40 years. With an MEd from Loyola University, he served in the Teacher Corps in Chicago. He is a professional sculptor and community activist. Barr has been a town meeting member since the ’80s and served as the director of Friends of Brookline Seniors, the PAC that led the successful fight to build the Brookline Senior Center, of which he is treasurer. Kevin Lang – Dr. Lang is a professor of economics at Boston University. He holds a BA from Oxford University, an MSc from Université de Montréal, and earned his PhD from the Massachusetts Institute of Technology. He served on the Brookline School Committee (1996-2009) and as a town meeting member 1993-2012. He is an elected Fellow of the Society of Labor Economists. Judith B. Mir – Judith Mir was a senior marketing and research analyst for advertising and public relations firms in New England. She served for ten years on the board of directors for Jewish Family and Children’s Service, concentrating on board development. Judith is on the board of directors of the Friends of the Brookline Public Library, currently working on branding and membership. 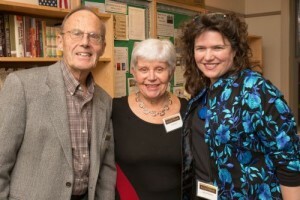 She is on the Advisory Committee for the Brookline Senior Center, and has been a member of the Brandeis Osher Lifelong Learning Institute since 2015. Betsy Pollock, LICSW – Betsy Pollock is director of Social Work at the Mt. Auburn Cambridge Independent Practice Association. She holds a BA from Simmons College and an MSW from the Ohio State University School of Social Work. She is a member of the Academy of Certified Social Workers of the National Association of Social Workers. Since 1986 she has been president of the board of directors at the Brookline Senior Center. She was chair of the Human Relations-Youth Resources Commission from 1976-1986. She was a Town Meeting member from 1986-1993. She is a lifelong resident of Brookline and a community activist. Yolanda Rodriguez – Yolanda Rodriguez is Chair of the Council on Aging and a member of the Board of Directors for Springwell. She was a Town Meeting member for 8 years, stepping down to serve as the first Teacher in Residence for the National Board for Professional Teaching Standards in Washington, D.C. After retiring as Department Head of Mathematics (Grades 6-12) for Wellesley Public Schools, Yolanda found the active community at the Senior Center, joining the Council in 2011. Suzanne Salamon, MD – Dr. Salamon is a geriatrician at Beth Israel Deaconess Medical Center. She serves as a volunteer in the Brookline Medical Reserve Corps and the Community Emergency Response Team. She received the 2012 Public Health Leadership Award from Friends of Brookline Public Health and she writes a monthly column about health issues for the Brookline Senior Center newsletter. Carol Sapoznik – Carol Sapoznik began her career at Crate & Barrel, where as Vice President, she built the company’s business on the East Coast and in Canada. She is the creative force at ConnectionsAndDots.com where she shares her passions: family, travel, learning, championing the development of girls and women, building relationships and her belief that “every day, you can make a difference.” A graduate of the University of Wisconsin, Carol serves on the board of Girl Scouts of Eastern Massachusetts, REACH, Back Bay Business Board, University of Wisconsin Retailing Board and The Boston Club, where she is a co-chair of the Corporate Relations Committee. Roberta Winitzer– Roberta Winitzer is a member of BCAN’s steering committee and Age Friendly Cities. During her 12-year tenure on the Library’s Board of Trustees, she created and chaired Brookline Reads. She is a member of the Brookline Library Foundation, co-leads the Putterham Library book group and is a fundraiser for the Center.